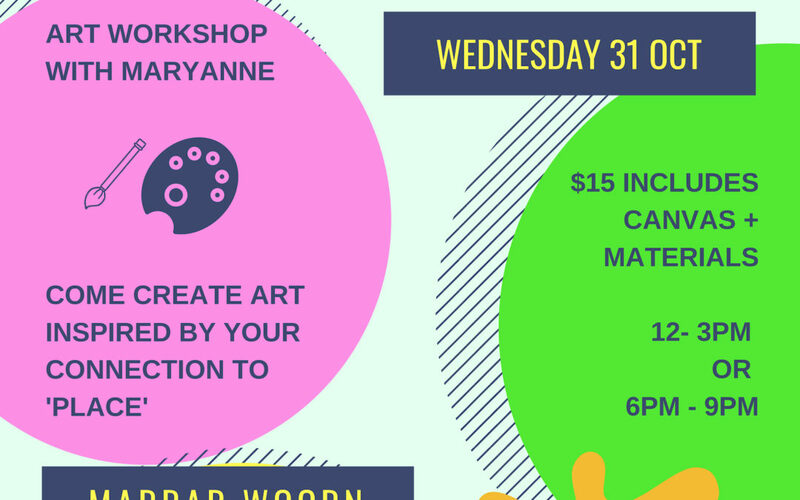 We are very excited to be working with local artist and educator, Maryanne Gatica in her classes designed to support the Apollo Bay Arts Inc fundraiser, ‘Place’. Choose form one of her 2 adult classes held on Wednesday 31st October at Marrar Woorn, for all artists at all skill level. In her class you will be provided with the canvas and materials needed for you to create your entry to the ‘Place’ exhibition, on display at the Apollo Bay Arts Inc Gallery throughout December. Maryanne will guide and support you through the creative process and by the end of the class you will have your entry sorted. Price of the class includes canvas, materials and exhibition entry fee.